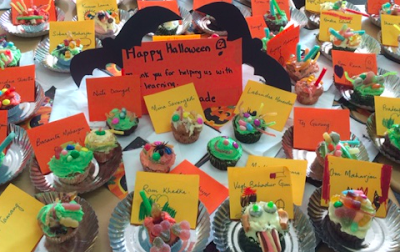 During the Halloween celebration on October 30th, Mrs. Sunderman's third graders decorated monster cupcakes to give to all of the support staff at the Lincoln School. The support staff helps student learning in invaluable ways every day and the third graders were excited to make a small gift sharing their appreciation. Pawita a third grader said, "I felt happy, excited, and proud to give the support staff treats to enjoy." Jasmina, "I thought it was really cool, because we got to make our cupcakes. It felt good to make cupcakes for someone else." Rylan, another third grader said, "I felt pretty good about making the cupcakes, because the support staff helps the school." Over 70 cupcakes were decorated by students! Students worked to create unique and attractive monsters as well as Halloween themed thank you cards. Stay tuned for upcoming events as the third grade class class seeks to care for their community.